The artist Sidney Nolan painted desert adventurers and shipwrecked travellers, but in the end, it was an Australian outlaw who catapulted him to fame. 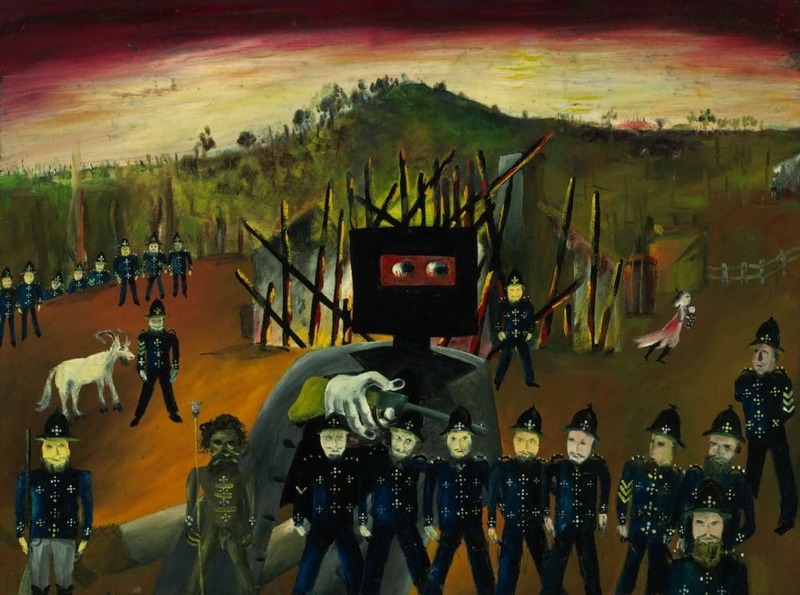 Nolan’s celebrated Ned Kelly cycle of 27 paintings – a series completed with extraordinary swiftness between 1946 and 1947 – features Kelly’s violent showdown with police. But Kelly, who was arrested and executed in 1880, aged 25, was also the artist’s most enduring subject. Nolan returned to him throughout his life, perhaps recognising something of the bushranger’s rebel spirit as his own. Today, both artist and outlaw appear to be the most quintessential of Australian figures. But many of Nolan’s subjects spring from the experiences of British and Irish settlers in the 19th Century; Kelly was the son of an Irish convict who’d been transported as a young man from Tipperary to Van Diemen’s Land (now Tasmania) for stealing two pigs. Nolan himself had Irish heritage – and spent the last 40 years of his life living in the UK. 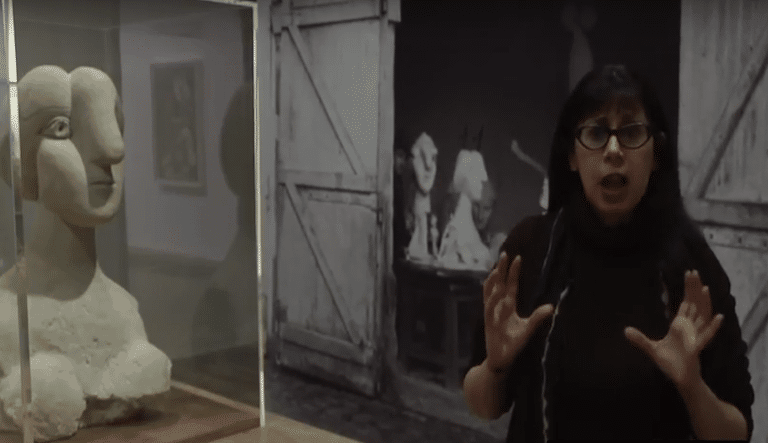 These connections to Britain are being explored in a series of events and exhibitions celebrating Nolan’s life and work this year, the centenary of the artist’s birth. When Nolan moved to the UK in 1951, he was championed enthusiastically by influential figures in the British art world. One significant figure was Kenneth Clark, former director of the National Gallery in London and later the writer and presenter of the BBC’s groundbreaking series Civilisation. Having first seen Nolan’s work while in Australia in 1949, Clark had encouraged the artist to move to London. He became an eager patron and purchased several paintings by Nolan, among the most important being the mysterious Convict in a Billabong –based on the story of an infamous kidnapping of a white woman by a native Aborigine and her rescue by an white Australian convict – and the eerily empty, cratered landscape of Central Australia. Part of Nolan’s magnetism was his ability to evocatively reinvent many of Australia’s colonial folkloric figures. 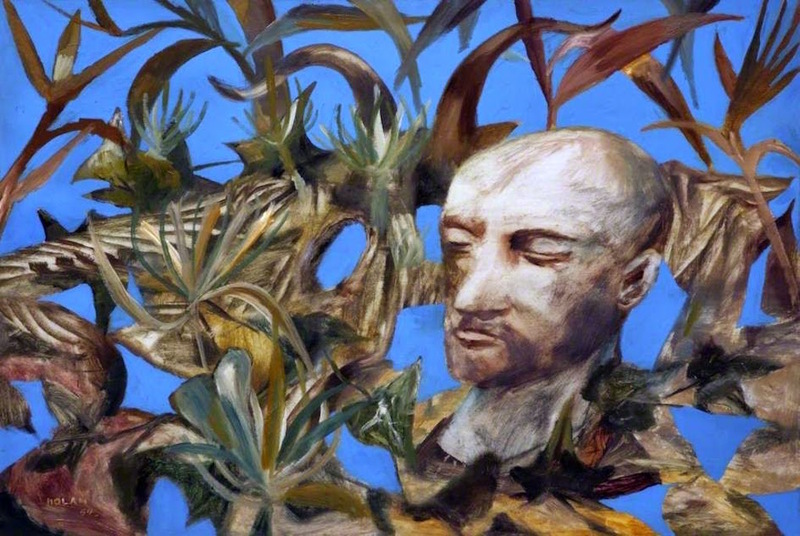 His profoundly disquieting series of paintings featuring two ill-fated desert adventurers, Burke and Wills, is particularly strange and haunting. These paintings speak eloquently of the tragic hubris of the white settler to this inhospitable continent. Ill-equipped and ill-prepared, Robert O’Hara Burke and William John Wills hatched a foolhardy plan to hike cross-country across Australia’s desert planes (from Melbourne in the south to the Gulf of Carpentaria in the north, a distance of some 2,000 miles). Lacking the deep knowledge of the land possessed by indigenous people, they, along with most of their crew, perished on their return. 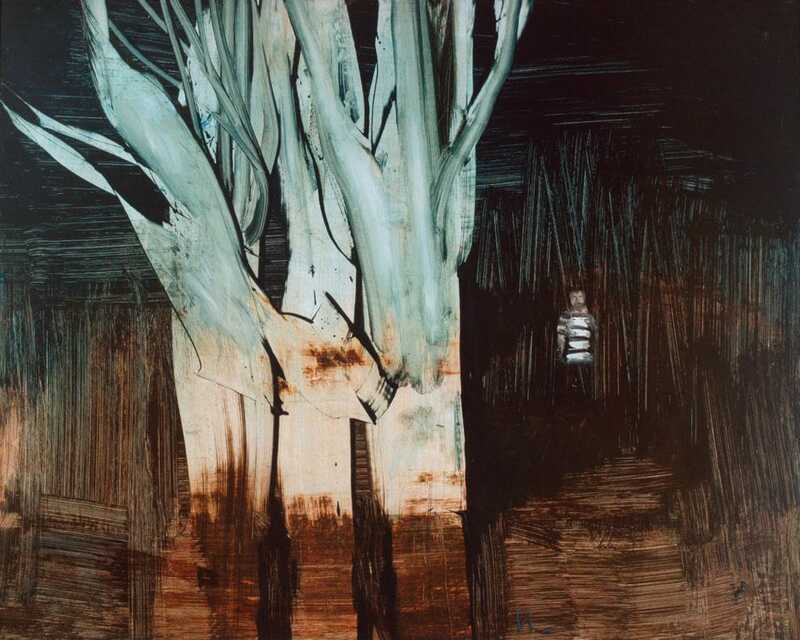 Nolan’s Mrs Fraser paintings, of which Convict in a Billabong was one, tell a similarly devastating story. In the 1860s, Eliza Fraser and her husband were shipwrecked on an island off the coast of Queensland. After her husband was murdered by Aborigines, Mrs Fraser lived among them. She was eventually rescued by an escaped convict, David Bracefell, who became her lover and whom Mrs Fraser eventually betrayed to the authorities, whereupon he received a death sentence. These themes may have spoken to Nolan deeply. Before he left Melbourne, Nolan had lived with his art patrons John and Sunday Reed, conducting an open relationship with Sunday. He was bitterly hurt when she eventually rejected him after refusing to leave her husband. Nolan’s work may have been resolutely figurative, mythic and narrative-based, but it still retained a sense of modernism firmly wedded to the 20th Century. Yet his paintings opposed the trajectory of much modernist painting of the postwar period – particularly American painting, in which abstract art was dominant. What Clark saw in Nolan’s work was an escape from what he perceived to be the sterile dead-end of formalist abstract painting. There were always the figurative paintings of Francis Bacon, of course, but Clark found Bacon’s vision far too bleak, far too cruel, its preoccupation with human suffering offering little in the way of moral or spiritual uplift. In Nolan, Clark found instead an artist pursuing the enlightened and humanist tradition in art. Nolan was also championed by Bryan Robertson, the influential director of the Whitechapel Gallery. The gallery hosted a major and important retrospective in 1957 to honour Nolan’s 40th birthday. A huge critical and commercial success, it succeeded in putting Australian art firmly on the British map. The poet and critic Al Alvarez summed up Nolan’s appeal to the English somewhat cynically, though perhaps with some accuracy, when he said that in Nolan’s work “it seemed possible for [the English] once again to discuss paintings without ever quite discussing paint.” The English were embedded in a literary tradition and were, according to Alvarez, bored by “painterly values”. Eager buyers such as the writers CP Snow and Stephen Spender were drawn to Nolan’s literary and lyrical qualities, while Clark himself was encouraged by Nolan’s reinvigoration of figurative painting. “When time has weeded out [Nolan’s] colossal output and the didactic snobbery of abstract art has declined he will be of even greater renown,” Clark later wrote in his autobiography. But whatever Nolan painted after leaving his native Australia, what he always will be remembered for are his early Ned Kelly paintings. Bright, bold, strikingly cartoonish and yet compositionally complex, a tragicomic mood haunts the series. In the 1956 painting Ned Kelly, Kelly himself appears as a black silhouette, clad in his clunky DIY armour to protect him from police bullets. His head is not even head-shaped, but simply a flat square. Through his cut-out slot for eyes, you can see the vast sky and horizon of the Australian outback. It was an instantly iconographic image, reminiscent not only of Malevich’s modernist black square, but also – especially where we find Kelly astride his horse in perhaps the most famous image of the series – of a crusading knight. Nolan deliberately and comically subverted the old ideals of nobility and civility associated with the Old World to suit the rougher contours of the New World. Kelly’s cypher figure isn’t deployed simply to illustrate the young bushranger’s story, but to capture something quintessentially Australian: the rebel streak of the outlander who animates this robust, rough and inhospitable terrain, one involuntarily settled by British and Irish convicts.